ON SALE NOW! Enjoy up to 20% off our regular rates for last-minute bookings. Enter your dates to see the best price. ROMANCE and relaxation abound at Paris Perfect's 'Chambertin' apartment, an exceptionally beautiful one bedroom with incredible views of the Eiffel Tower (in the winter) that are nothing short of wow. LOCATED in the celebrated 7th arrondissement, the Chambertin is a stone’s throw from some of the city’s most masterful sites, shops and cafés, making it a fantastically central locale to indulge in all things Paris. Take a quick stroll to the open-air markets or the charming Rue Cler market street, before embarking on a leisurely stroll through the enchanting Champ de Mars gardens and along the Seine riverbanks. A worldly collection of fashion houses, boutiques and artisan cheese and chocolate shops are all nearby, making the Chambertin an ideal retreat for a purely indulgent Parisian holiday. 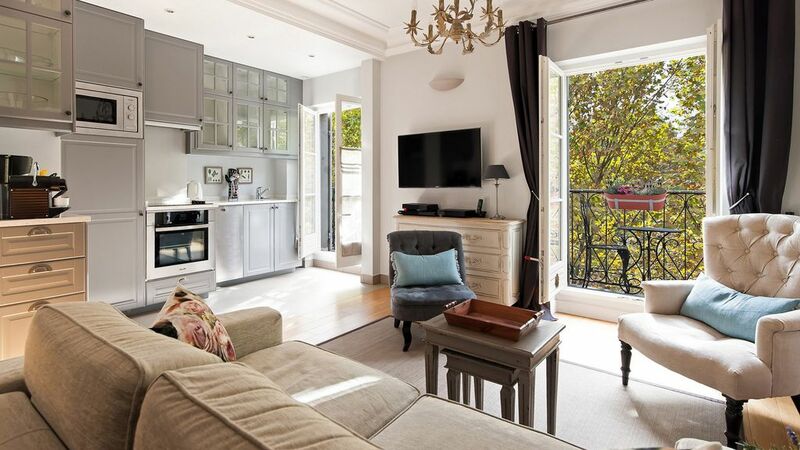 IN THE LIVING AREA and throughout the apartment, the décor and furnishings of the Chambertin expertly match the romance and style of the surrounding cityscape, while providing a dreamily private oasis for visitors. The open floor plan is adorned with subtle hues of grey and white, with plenty of plush places to relax, including a sofa bed that provides an additional sleeping space. THE KITCHEN AREA has been perfectly designed for quick meal preparation followed by a comfortable dining experience. THE BEDROOM, with an extra-wide queen bed, antique furnishings and softly lit décor, is a perfect retreat for a dreamy rest at the end of the day. THE BATHROOM is the pinnacle of sheer indulgence, with a separate shower and claw-foot tub. If the outstanding location and beautiful décor weren't enough, in winter you can also enjoy a view of the Eiffel Tower while enjoying a romantic bath in the luxurious claw footed bathtub. THE EIFFEL TOWER VIEW, which can also be seen from the living room and master bedroom, is best enjoyed in the winter months since the tower is obscured when the beautiful tree in front is in full bloom. HEATING is very good and there’s a modern AIR CONDITIONER that keeps the living room and bedroom cool on warm days. Every corner of the Chambertin is dedicated to comfort, but a guest’s favorite corner of the apartment is sure to be the stunning balcony, which provides a perfect nook for champagne and long, lingering meals with the Eiffel Tower the perfect backdrop. The ensuing setting of breathtaking vistas and a quietly luxurious living space is sure to be a breath of fresh air for any vacationer with an appreciation of comfort, style and altogether romantic living. Our Chambertin apartment rental in Paris is one of our most spectacular, with incredible views of the Eiffel Tower from your private balcony, living room, kitchen and even the luxurious claw footed bathtub! Guests tell us time and time again that watching the nightly lights on the Eiffel Tower from their balcony was the highlight of their vacation. One powerful air conditioner: excellent mobile unit which cool the apartment beautifully. Like all mobile A/C in Europe, the hot air is vented thru the windows via a large tube. Apartment is located on the 5th floor (6th floor American). There are 6 steps to the elevator. Playgrounds in the Champ de Mars with basketball courts, antique carousel, pedal cars, and more! See the sites on a Bike Tour, Segway Tour, Walking Tour or Seine river cruise. Departure points are not far from the apartment. Neighborhood is well-known for it's 'village' atmosphere with great cafés, restaurants, specialty food stores and market streets. Head to rue Cler market street for gourmet foods, delicious pastries and fresh fruit and vegetables. Napoleon's tomb rests under the golden dome of the nearby Invalides. Shop the boutique fashion and homeware stores along rue Saint Dominique and other streets within the neighborhood.